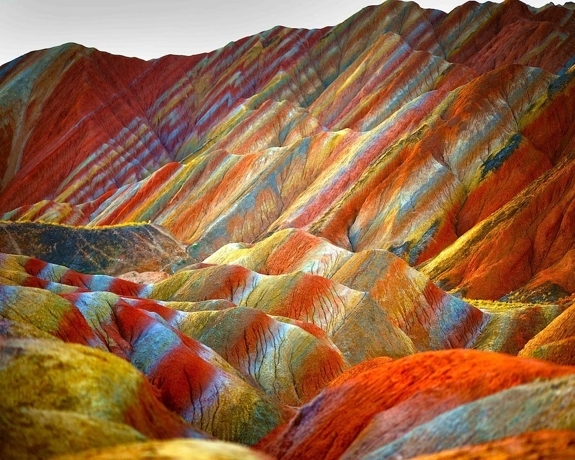 The area is often referred to as “the Danxia Landform,” though “a Danxia landform” would be more technically correct. Scattered around China there are at least seven Danxia landforms, the term being one geologists use for any red sandstone formation with cliffs caused by both endogenous forces (such as earthquakes and tectonic movements) and exogenous forces (like erosion and corrosion). 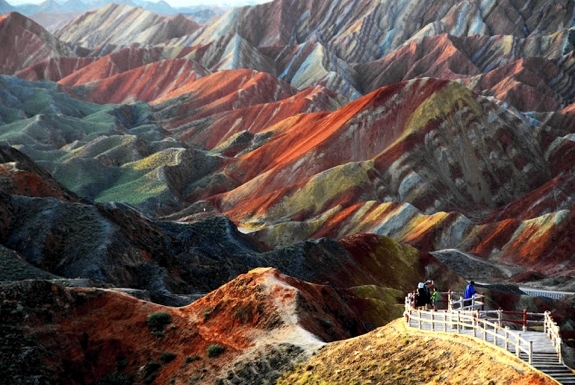 Some Danxia landforms look like waves frozen in rocks. Others — like the Yangyuan Stone and Yinyuan Hole, pictured below — suggest that Mother Nature has a rather juvenile sense of humor. 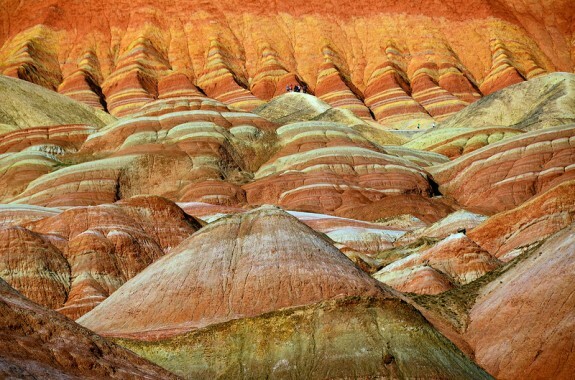 But only the Zhangye Danxia Landform Geological Park contains such spectacular colors. The park as a whole is about 400 square kilometers (150 sq mi), roughly 10% of which contains hyper-colorful mountains like those in the photos on this page. The mountain’s distinctive look is a result of two factors: an unusual mixture of different rock types (in different colors) and upward pressure on the earth’s crust. The rock types have various resistance to that pressure — over the last million years some have risen quickly, others have stayed mostly in place, still others have slid sideways — and all that creates the interesting patterns you can see today. In fact, the entire area of the park is still rising at a rate of almost a meter every 10,000 years. That’s pretty quick in geologic terms (though not so much relative to any other meassure). Happily, the most colorful area of the park has been left mostly untouched. A 2010 designation as a UNSECO World Heritage Site will hopefully keep it that way. Pretty much the only evidence of development you’ll see here is a viewing platform and a crisscrossing series of roads, boardwalks and paths. It all makes for excellent hiking. So, if you go, bring some good shoes. And a camera. 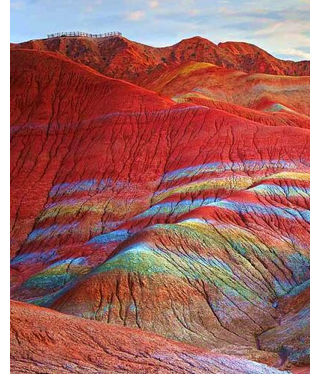 And leave a comment and let us know what you think the mountains of the Zhangye Danxia Landform Geological Park look like.